I need a secretary. Or a shrink. Oh man, where does all my time go! I spend my days panicking about all the things I’ve got to get done (my to-do-list stands at 15 items at the moment) and somehow manage to accomplish nothing. So frustrating. So I did my nails in a weird way on Sunday and took a pic to put in the blog, but of course I never got around to writing an entry and now the nails are completely different so the pic is old news. But since I did take it, here it is. Black polish with sparkly polish on top. Kinda goth disco. Or something. 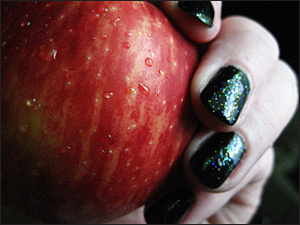 Looks a bit messy in the picture but it’s just because I had water on my nails from washing the apple. Erm. Yeah. I seem to be in this constant state of stress and panic at the moment. Over time running out on the wedding arrangements, the wedding itself, the lack of money… uhh. At least we’re going on Miikka’s cabin over the midsummer weekend, I’m looking forward to just completely emptying my head for a couple of days. Bliss. Saw Pirates of the Caribbean: At World’s End at the weekend. It was ok… very samey to the previous ones. Although a bit unnecessarily long-winded. I wonder how many of them they are planning to make. But still, it’s probably the first series of movies since Indiana Jones that just has that ‘pure entertainment’ adventure movie vibe, which is nice in a way. And of course, Keith Richards as Jack Sparrow’s dad was just pure genious.